Stop the echo and bring a bit of peace and quiet to your call center, gymnasium, server room or gun range with 80%-recycled acoustic cotton panels and hanging baffles. 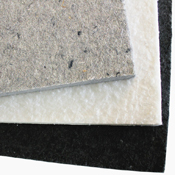 Echo Absorber™ acoustic cotton panels are an excellent choice for many different applications. Our product is sold in a variety of sizes and configurations, including convenient multipacks that make turning around a large project easy and affordable. One of our most cost-effective sound insulation materials, Echo Absorber™ panels and baffles effectively dampen low, middle and high frequency sounds as well as — or better than — other higher priced man-made materials. Cotton sound insulation is light weight and offers superior acoustic properties, particularly in areas where loud echoing is common. 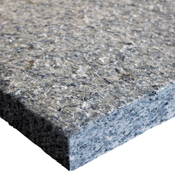 Acoustic cotton is an excellent choice if you are looking for a building code-friendly acoustic soundproofing material that can be installed permanently or temporarily in a variety of oddly shaped spaces. Our product is made of flexible natural fibers that are fungi-, mold-, and mildew-resistant as well as Class A™ flame-resistant, ensuring they will meet even the strictest building code requirements while delivering long-term performance and durability. 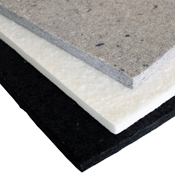 Echo Absorber™ acoustic cotton panels are an environmentally friendly choice, too. 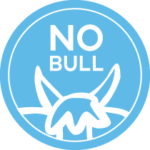 Our product is made from a minimum of 80% recycled materials, cutting down on waste. 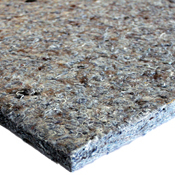 As well, it’s completely VOC-free and contains no fiberglass, formaldehyde or other potentially harmfully substances. This makes it a great choice not only for industrial applications but also for environments such as office buildings, classrooms and other spaces where long periods of exposure are common. Echo Absorber™ cotton acoustic paneling is perfect for call centers, offices, conference rooms, gymnasiums, theaters, studios, computer rooms and auditoriums, as well as manufacturing, industrial and warehouse facilities. Its high density means it excels at stopping ambient echoes and reverberation, though it can also be installed inside wall paneling to prevent sound transfer. For heavy-duty applications where maximum sound deadening is required, our 2” thick panels deliver an average noise reduction coefficient of 1.00. A 1” thick version is also available for less-demanding applications. Visit individual product pages to view detailed specifications. Echo Absorber™ cotton paneling is easy to cut to size and install in any application, making it a great choice for both DIY and professional projects. Be sure to purchase a tube of our PL® premium construction adhesive when you place your order! The Echo Absorber™ line of cotton acoustic panels and baffles is just one of the many soundproofing materials we offer our customers. To learn more about any of our products, or for assistance choosing the best material for your needs, contact our office and speak with one of our experts directly.